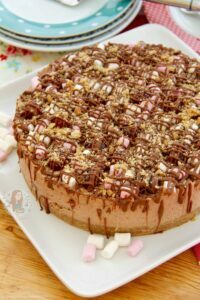 A Delicious and Chocolatey No-Bake Rocky Road Cheesecake with all the Rocky Road goodness inside and out! 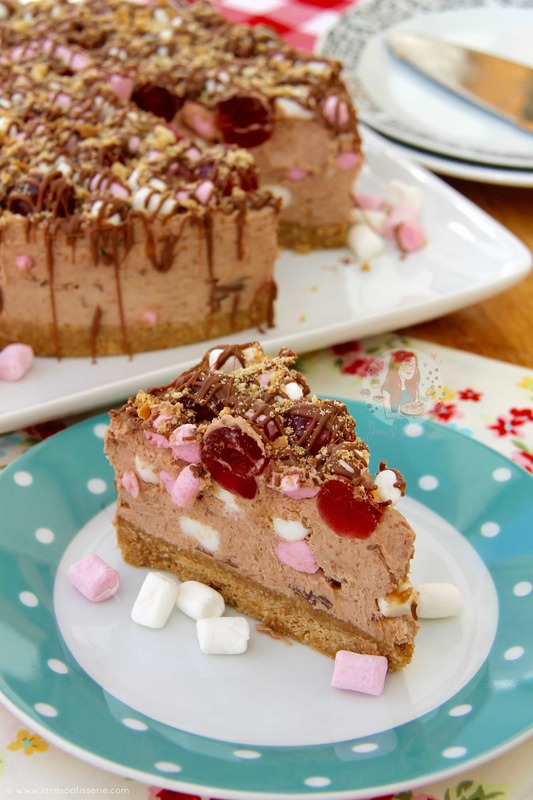 Perfect non-bake dessert for all Rocky Road fans! 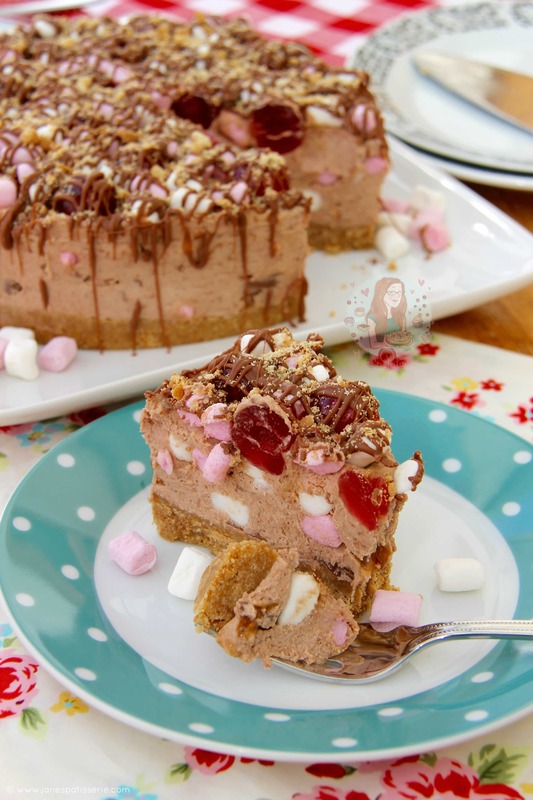 Hello heaven – Rocky Road AND a no-bake chocolate cheesecake?! 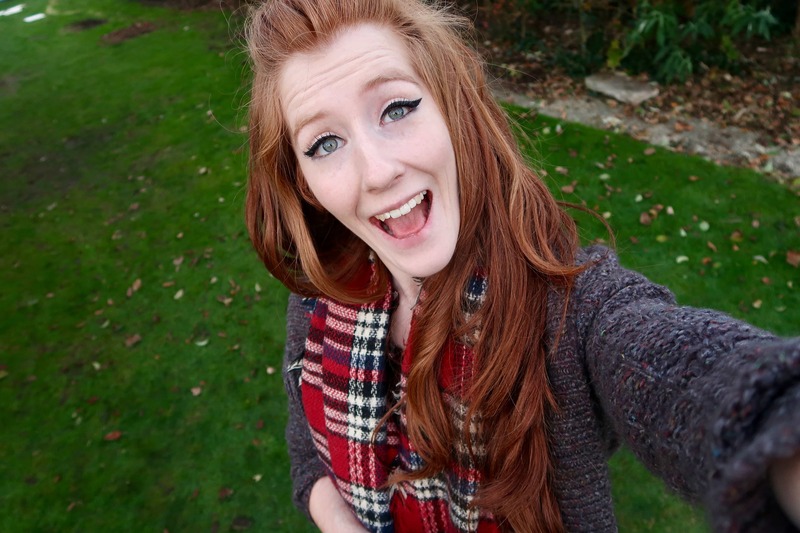 Literally just like wow. I have obviously done many a cheesecake recipe by now, but after SO many requests, like so so so so SO many requests, I finally did my No-Bake Rocky Road Cheesecake. I have a baked version on my blog, but y’all love the no-bake cheesecakes, so I decided to oblige as I was craving something yummy. For those of you who have never had the delight of tasting a Rocky Road it is basically a mash up of chocolate and marshmallows, with the addition of anything you like such as biscuit bits, raisins, cherries, other chocolates, and more! It is utterly delightful and heavenly. 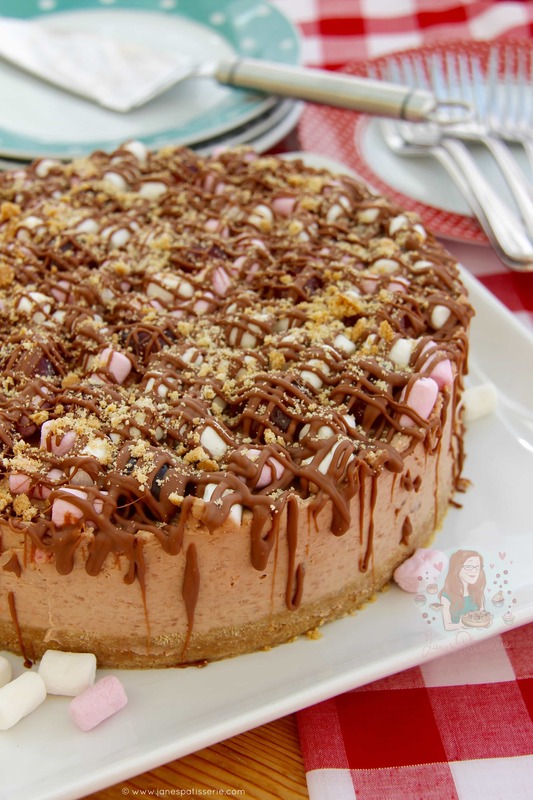 It is of course, pretty easy to make as you just melt the chocolate and mix the ingredients in and set it, so I thought I would ramp up the idea and make yet another cheesecake version of it! I based the idea of what I included in the ‘Rocky Road’ side of things on my Rocky Road recipe which has always been a massive success. It also takes inspiration from my No-Bake S’mores Cheesecake which is very similar in the sense of chocolate & marshmallows & biscuit. Yum! 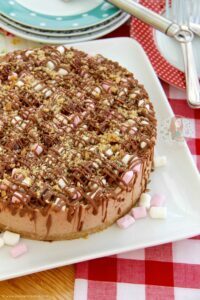 This cheesecake is super delicious with a simple chocolate cheesecake, with mini marshmallows running through it on top of a simply delicious buttery biscuit base! 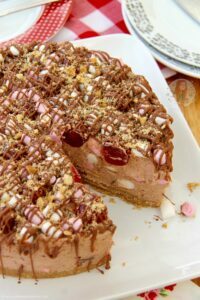 However, as in my Rocky Road recipe, I also added in some Crunchies to the cheesecake as they are a very important part of my rocky road, I simply HAD to involve it in this to! I decorated it with a drizzle of melted chocolate and some biscuit bits to give it the added crunch! 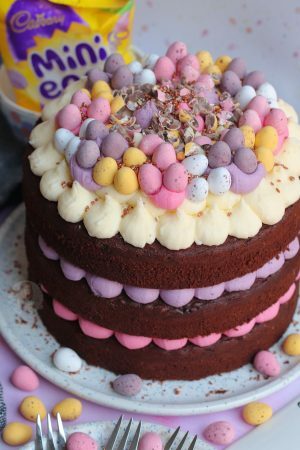 5) Chop up the Crunchies and fold through the mixture with the 75g of mini marshmallows – Pour the mix on to the biscuit base and smooth over. Push the glacé cherries and extra mini marshmallows for decoration into the top of the cheesecake so that they set into the cheesecake. Cover the cheesecake, and chill in the fridge for at least 5-6 hours hours or preferably overnight. 6) To decorate the Cheesecake – Remove the cheesecake from the tin carefully – I use a large thin metal spatula to get it off the base, and smooth the edges with a knife, and decorate with some melted chocolate and then some crushed biscuits! Hello No-Bake Rocky Road Cheesecake. As I said earlier, this is my version of a No-Bake Rocky Road Cheesecake – It’s a basic non baked Chocolate Cheesecake with rocky road goodness added in and all over the top. I use Full-Fat Cream cheese because that is how it sets and holds itself – if you use lower fat or fat free stuff it won’t work, and it’ll probably curdle. I also set my cheesecakes in the fridge overnight as it makes it so much easier, and it is much more likely to have finished setting! All of my no-bake cheesecakes can be frozen, but only once they have been set overnight in the fridge – skipping the setting stage will mean it’ll probably go runny or go weird! Find my other Cheesecake & Rocky Road related Recipes on my Recipes Page! 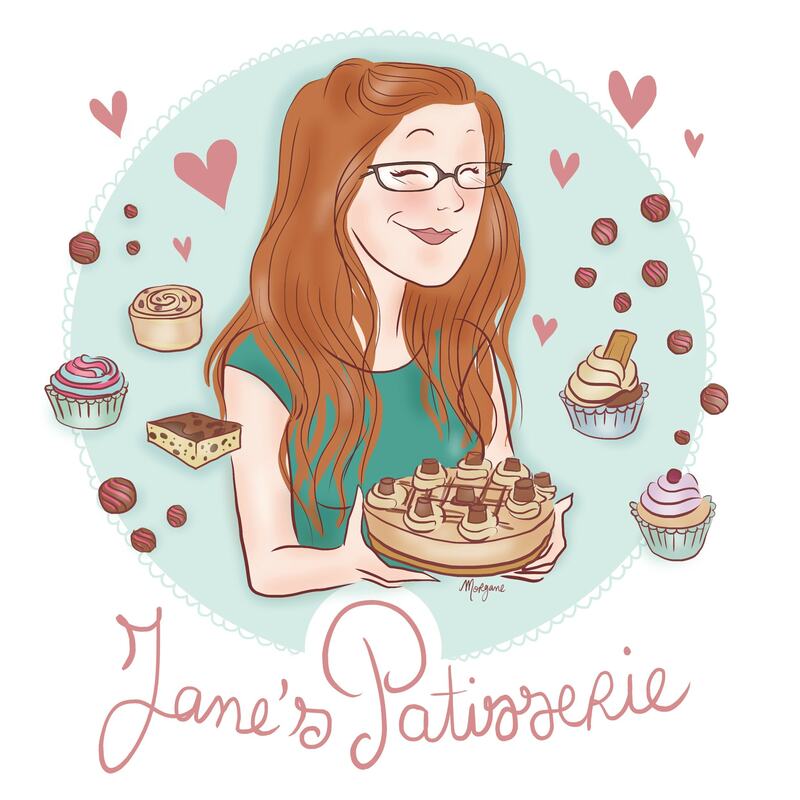 Older Next post: Gluten-Free Chocolate Cupcakes! Newer Previous post: No-Bake Rolo Tart! 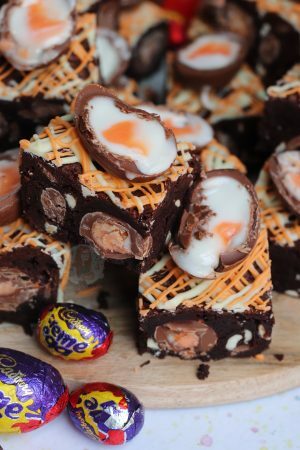 This looks amazing, I have already made your cornflakes rocky road into Christmas pudding shapes and am planning to make this (along with your lemon roulade) for Christmas Day, lovely tasty but easy to follow recipes!! Our family aren’t big cherry fans, can you think of anything to substitute but still give the same lovely effect? 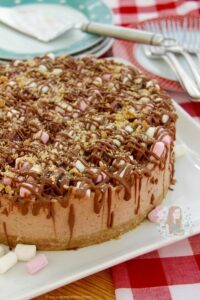 I found your site a few weeks ago, and I made Mint Aero cheesecake last weekend. It turned out fabulous, and was truly scrumptious. Thank you! I’m going to make Rocky Road cheesecake this weekend. Yum!!! Approximately how many glace cherries did you use? And do you cut them in half? Could i put in some chopped up rolos instead of crunchies? It looks fab! Hi! Is there any way I could substitute the Crunchies for something else, or just leave it out? This looks absolutely delicious. 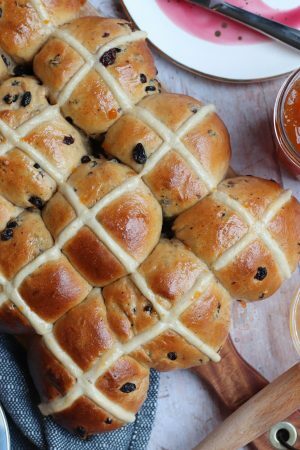 And to know that you don’t even need to bake it is just a bonus. I need to try it out as soon as possible. Another lovely cheesecake to drool over. When you said “my cheesecakes can be frozen” this has got me super excited! How? For how long? How long before I can eat it from frozen? The how long depends on what you use – I only usually say up to a month to be safe, but stuff can realistically be frozen for longer so it’s open to interpretation. And how long before you can eat it it depends on where you are and the weather so again I can’t really say haha – till its thawed! I’ve loved all your rocky road bakes so far Jane but I think this rocky road cheesecake has topped them all! That topping looks DIVINE!